Looking for something free to do? All that shopping and eating left you heavy with your pockets empty? The Brisbane outdoors offers a great playground for the adventurers, as a respite to your wallet and waistline. Here's a great free, fun, and healthy idea - Mountain biking! It's not for the faint hearted but by no means does it have to be an extreme death-defying sport. Mountain biking in Brisbane can be fun, even for beginners. It gets the heart rate up; offers a different type of sightseeing; and is an opportunity to tune-in to nature. And as a bonus you feel less guilty about your later food indulgences. The great thing is, you don't have to go far. The trails of Mt Coo-tha and Gap Creek are a good place to start mountain biking. 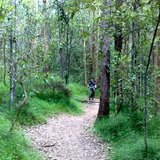 It's a beautiful bushland reserve with legal, maintained tracks, and caters to every level of rider whether you want to plod along slowly or hear the whoosh of air in your ears. Mt Coo-tha Forest is only 15 minutes away from the Brisbane CBD, but with more than 15000 hectares of open natural eucalypt forest and wildlife, you'll feel like you've escaped the hustle and bustle of the city. The smell of eucalypt leaves, dirt, and bark as soon as you ride into the reserve should put you in an adventurous state of mind immediately. If you're into animals, look out for them on your ride. Approximately 370 animal species live in Mt Coot-tha Forest, including a number of rare and threatened species like the Powerful Owl. Other animals you can see while you're exploring the forest include goshawks, eagles, wrens and robins as well as possums and bats. Before your first venture out the Gap Creek Trails, have a good study of the tracks on a map. Mtbdirt provides some good information on the different tracks and their level of difficulty. The Gap Creek Trail Care Alliance also has information about the area, mountain biking, and environmental care. Of course the act of mountain biking is free itself, but you do need to have the right gear. Like for a start, a mountain bike. If you don't have one and can't borrow one from a friend, don't worry – they're not that expensive these days. Bike shops are popping up everywhere resulting in more competitive prices. Taylor Cycles in Chapel Hill is conveniently located only five minutes from the Gap Creek trail entry. They can fix you up with a bike, accessories, and anything else you need as well as provide some pointers on riding in the area. Brisbane's got the weather and the scenery for some good outdoor fun so make the most of it. Give mountain biking on the Gap Creek trails a go for something free, healthy and active to do.